When the weather gets cooler my mind turns not only to knitting but also to making body products. I made chapstick already last year, but wasn’t overly happy with the recipe, so I tried a different one this year. No coloring, no scent, no smell. I actually like the faint smell of beeswax 🙂 I was aiming for three or four tubes worth of chapstick and eyeballed the quantity. Now I’m not that good with numbers, so eyeballing was probably not the best idea in the first place. I made 50grams total, which turned out way too much (mental note: make only 25grams next year!) and ended up giving away the extra tubes to my work colleagues. The process is very simple: 1. 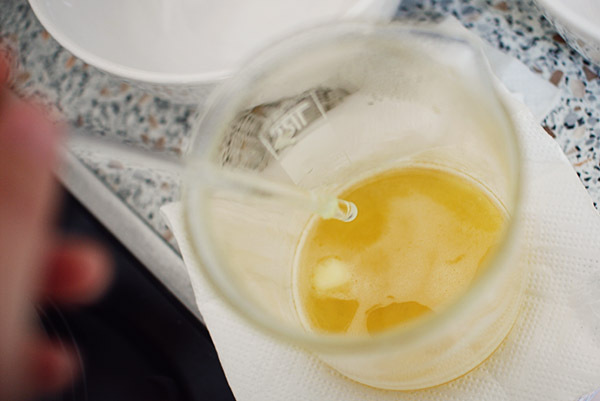 Melt the beeswax and cocoa butter in a boiling water bath. 2. Add the coconut oil and the olive oil (return to double boiler briefly if the beeswax solidifies again). 3. Pour it into the empty chapstick tubes and let it cool down. Done! 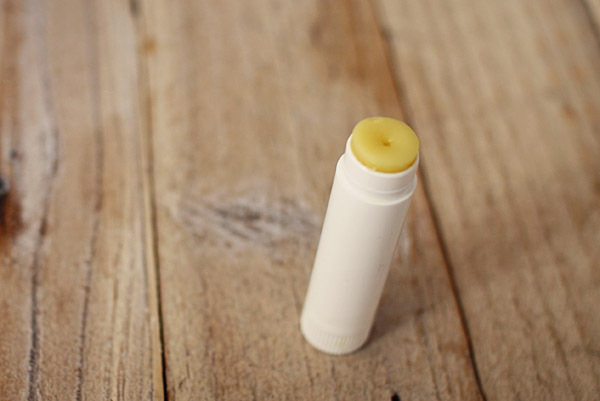 A great and simple chapstick to protect your lips from the cold in the coming months, without artificial flavorings, colorings, preservatives etc. Since you’re only dealing with oil there is no need for preservatives. I only use my chapstick for a couple of months before making new one though. 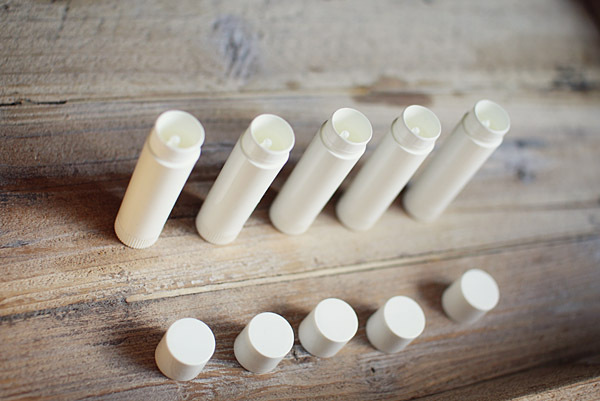 This entry was posted in Other Crafts, Soapmaking & Products and tagged body products, lip balm, making chapstick, recipe on October 13, 2011 by Kristina. wow, this is awesome! I would love to try making some, too. wowww!! I admire you! I thought it wasn’t possible to do it at home!! And it’s perfect to have enough chaptstick for all the year! Impressive. It looks so simple, so natural! Where do you get the empty chapsticks, btw? 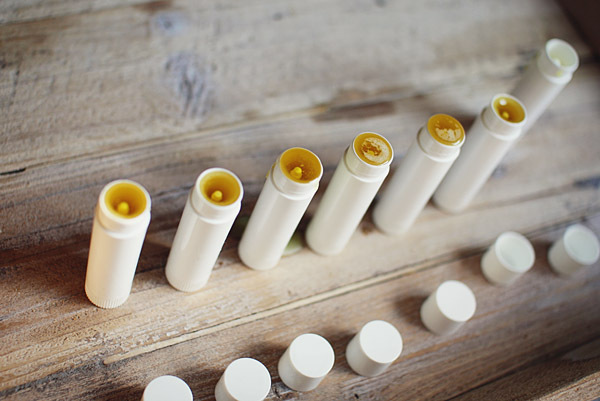 If you have bought chapstick and it is getting empty, you can always reuse those containers as well! 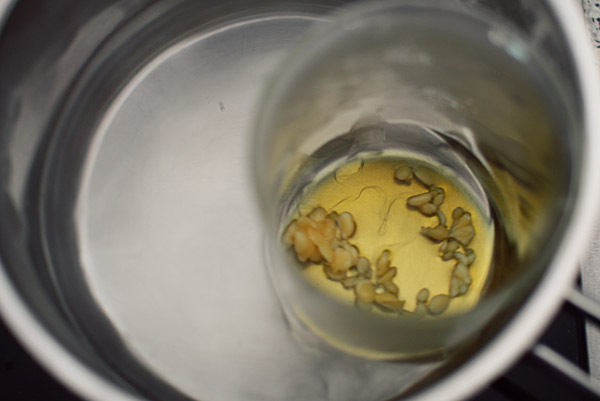 I just clean them out with a toothbrush and let them dry before refilling. Thanks Neus and Ana, it is a really simple process, takes about 10 minutes all in all! Ana, I get the chapstick tubes locally from a shop that sells soapmaking and other craft supplies. You should be able to get something similar online though. Do you have more exact measurements? I would like to make them as part of my girlfriends Christmas goody bags but would like to have better idea of the amount of ingredients to purchase. Thanks! Good morning! About your comment in my blog I didn’t know any of the girls before! But they turned to be so nice!! And about my Wiksten dress, I wish I had lengthen the pattern. In fact yesterday I was wearing it at work and it was feeling like…ohh I want 4 cm more! It sure looked like a fun time, how did you guys meet then? I like longer dresses as well, I don’t feel comfortable in the fashionable short skirts and dresses, so when possible I lengthen them up to 7 cm! If you melt the oils first the butter and wax should just melt right in right? And then you wouldn’t have to worry about the beeswax solidifying again? I have been making my own salves for my eczema and I heat the oil and extras next and beeswax last. Great recipe! 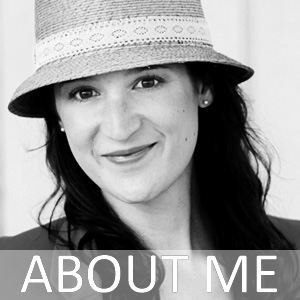 I love making my own body products, thanks for sharing! Rachel, that would work, I didn’t think about heating the oils first. Thanks for the idea! I am going to try this! I needed some Christmas gift ideas! Thanks! Where do you buy the bees wax coconut oil and cocoa butter? Would love to make these for my girls as a gift. Found the tubes online but, you had to buy way too many. Donna, I buy them from a german online-shop. 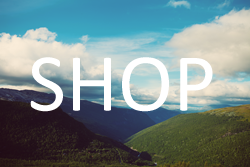 Have a look at shops that sell soapmaking supplies, you should be able to get all the oils and butters there! How soft is it when it’s done? I’ve been looking for a good recipe for making the little Carmex-y-tiny-container-spread-it-with-a-finger ones. Mh, hard to describe…it’s pretty hard, but it melts at your body heat, so it should be usable for tins to spread with a finger as well. Excellent idea, would it work just as well if you stored it in a little pot…? Wendy, I’m sure that would work as well! Great Idea. I’m looking for two things: 1) simmering potpouri recipe and 2) coffee/sugar scrub using fresh coffee grounds (not used). Any ideas? Thanks! Hi Dorena, nope sorry, I haven’t seen a recipe for either. Have you tried googling and looking through pinterest? Hey Dorena- here is a coffee lavender scrub! Haven’t tried it yet but I’m planning on making the Love Ya Honey scrub on my Christmas Craft board as a gift this year. I make salt and sugar scrubs using almond oil for the sugar and sunflower oil for the salt. I use the widemouth jars so you can get your hand in them. I pour to salt or sugar in the jar and after mixing some essesential oil, I just pour until it is full. I mix epsom salts and Koshar salt for the salt scrubs and a various sugars for the surgar scrubs. Love the idea. I like having products made at home, they are a lot healthier for you. Definitely! That’s what I love about making soap and other products, you know exactly what goes in there and can use quality ingredients. Oh thanks for the idea! I might make some minty ones. Thanks for the DIY, Kristina! I have been meaning to make chapstick for some time. 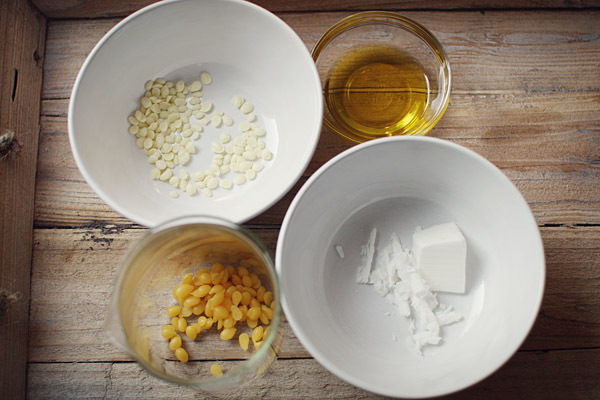 I try to use products that have as few ingredients as possible, so your tutorial is perfect. I may have to add peppermint oil to a tube because I love peppermint chapstick. Great idea… I didn’t know that making chap-stick is so easy!…. i really like it.. thanks for sharing. I am going to try this! It seems so simple, yet so much better for your body. Can’t wait to try this! Since this winter will be financially tight, I will now have cute little chapsticks for everyone. Any ideas on how to decorate the tubes? @ Lily and Jessica, you could definitely add a couple of drops of peppermint oil or any other essential oil to the mix, I wouldn’t use more than 2 or 3 to try first though. Thank you for the great recipe! It’s really amazing! I hate non-natural chapsticks, so I use honey instead of them. But it’s so uncomfortable to bring honey with you in bag, everything became soiled in it! So I love your easy and amazing idea! And certainly will try it! Hope you will not mind if I tell about this idea in my blog (it’s russian language) and use your pictures. Sure, I will give a link to this post. @tashah, I bought my tubes locally, but you should be able to find them online. @all I’m loving the suggestions for adding rose water, cherry juice etc to this recipe. Let me know how it works out if you try it! Just a word of caution though: If you add anything water-based to this you’ll need to add preservatives as well, The bacteria in the water would get the chapstick to spoil in a matter of days (you might not see it but the bacteria will multiply quickly and you wouldn’t want to use chapstick full of harmful bacteria!). I have no idea why, but for some reason these natural chapsticks are drying out my lips like crazy!! This is the second one i’ve tried. Any ideas as to why? I usually use vaseline by itself, but i’d like to go a more earth friendly route. I am a chapstick addict! I have to try this…soon. from where I get these materials please ? Quick question – do you know of any alternative to coconut oil? I’m highly allergic (read: breakouts that look like cold sores) and have to stay far away. Thanks! I substitute coconut oil with palm oil and it normally works just as well. Thanks for the step by step instructions. Now I think that I can do this and will not have to depend on store bought any more. No contaminants ! Great! I would love to try this, but I am allergic to beeswax…What would you recommend as a substitute? I am getting a website together called http://www.mineral-makeup-cosmetica.com. Its about creating awareness for toxins in cosmetics, buying smarter and offering home made recipes as an alternative. This recipe is great and, with your permission, I would like to add it to my site … with full acknowledgement to you as the contributor. I would like to use the photos and your text and I will add some of my own text to make it a full article of around 600 words. Nothing for you to do … I will do everything. Marcel, I can’t seem to access your site, I get an error message every time? Both links worked for me. I guess another option would be to copy and paste into your browser. Hope it works this time for you. PS – In Malawi at the moment for a few weeks and my neighbour has recently adopted an abandoned elephant. Very off topic … but heart warming nonetheless. Hi Marcel, now they work for me too. Strange. Nice site, and you’re welcome to use my blog post. Just note that the original recipe is from another site (I linked it in the text). The elephant story is amazing!! Have a great time in Malawi! Hi Jayce, I’m sure you can use peppermint oil.Just 1 or 2 drops should be enough and I don’t know if it will be safe to use it for weeks and weeks without a preservative. could i use olive oil instead of coconut oil ? and wnat could i substitute 4 beeswax ?!!!!!!!!!!!!!!!! You can use Gulf wax. It’s found in the canning or baking aisles at the supermarket. It’s usually used to seal mason jars when u make preserves but can be used in place of beeswax if needed. Pingback: DIY Bath and Body Products- Create and Share! I have just started making my own homemade chapstick and although my husband and family really like it I do have a question. How do you get it into the tubes without making a big mess. I’ve tried using an eye dropper and it got hard before I could squeeze it into the tube. Then I used a very small funnel and same thing..it firmed up and plugged the hole in the funnel. There must be an easier way and I am just not getting it. Thanks everyone for all the information. I learn a lot from all the posts. Hi Viola, I really just poured it in from the glass jar carefully…it worked fine. Hobby Lobby has the chapstik containers. I made this type of recipe into bars, using equal parts beeswax, coconut oil and almond oil, and poured it into molds. Then I popped out the bars and use them on my lips, and any skin irritations. Did you know coconut oil and honey both have antibacterial properties? Thanks Leeann, I hope this helps some commenters find the containers 🙂 I knew about honey, but coconut oil has antibacterial properties as well? Thanks Madie. I think 25 grams total is a good quantity, so then you break down the components to that (25% of 25grams and so on). Could I try to use instead of olive oil not refined sunflower oil? It smells so amaizing … like the fresh sunflower! Pingback: Last Minute Handmade Gift Ideas: Craft up these DIY Bath and Beauty crafts for holiday or winter birthday gifts!